The battle of Antietam remains the bloodiest single day in American history. A Guide to the Maryland Campaign, 1862 offers several day trip tours and visits many out-of-the-way sites related to the Maryland Campaign. Rob Orrison and Bill Backus both researched and led the interpretation for the Bristoe Station battlefield. Rob, a contributor to Emerging Civil War, has been working in the history field for more than 20 years. He currently oversees day-to-day operations of municipal historic site program in Virginia. Kevin Pawlak is the Director of Education for the Mosby Heritage Area Association and works as a Licensed Battlefield Guide at Antietam National Battlefield. He also sits on the Board of Directors of the Shepherdstown Battlefield Preservation Association and the Save Historic Antietam Foundation. Kevin also serves on the advisory board at Shenandoah University’s McCormick Civil War Institute and Shepherd University’s George Tyler Moore Center for the Study of the Civil War. The History Press published his first book, Shepherdstown in the Civil War: One Vast Confederate Hospital, in 2015. He is a 2014 graduate of Shepherd University, where he received his Bachelor of Arts in History with a concentration in Civil War and Nineteenth-Century America. Kevin is a regular contributor to Emerging Civil War. 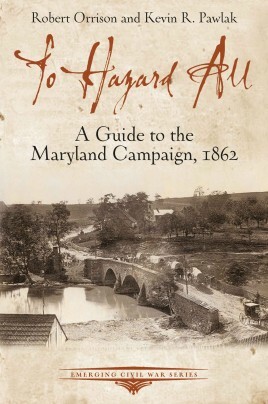 "The newest addition to the simply outstanding 'Emerging Civil War Series" from Savas Beatie, "To Hazard All: A Guide to the Maryland Campaign, 1862" is a valued and unreservedly recommended addition to personal, community, and academic library American Civil War collections and supplemental studies reading lists."